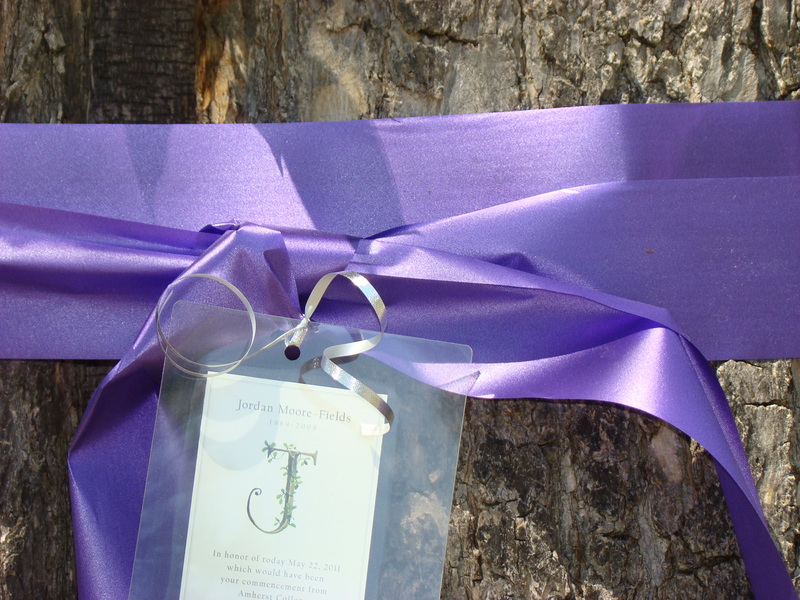 My family started on Friday evening adorning the trees around our home with purple ribbons and the placards I’d ordered. It was a labor of love that encompassed all five of us as we all took part whether it was affixing the ribbons to the trees, tying bows or threading the ribboned placards through a portion of the bow. The weather forecast called for rain all weekend and Mark and I were up early on Saturday to continue our task. 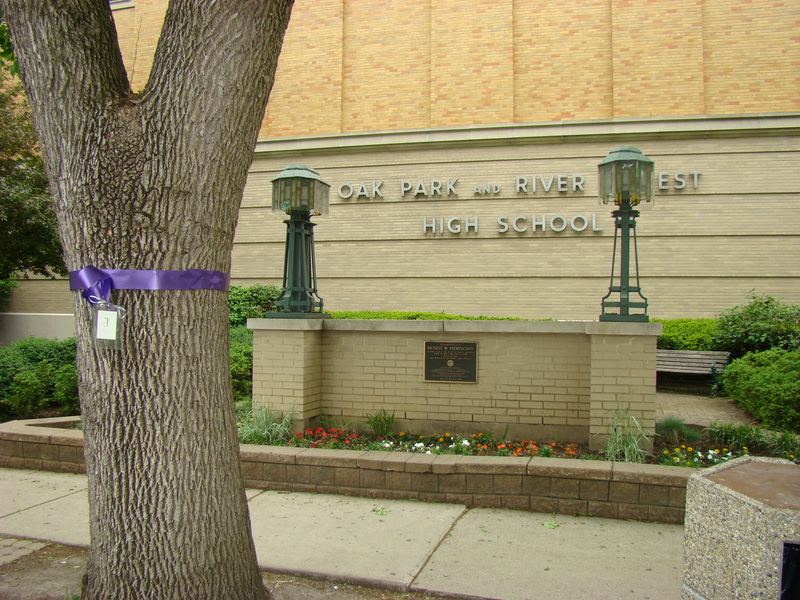 We tied a ribbon on a tree near a fast food hangout of all the high school kids. The day was sunny and as soon as we would tie a ribbon there would be someone walking by to read it. Kendall was with us and she watched beaming every time someone stopped to read the cards. “They’re reading about Jordan. It’s working.” Her pride engulfed me and we made a roundabout circle of our neighborhood placing ribbons on the trees by the park near our public library. One of our neighbors from our old block drove up and asked what we were doing. When we explained about honoring Jordan on that would have been his graduation her only response was, “Can I help?” Mark grabbed a spool of ribbon and handed it to her through the car window. As she drove off she said, “I’ll make sure Linden is covered with purple ribbons.” As we walked back home planning to put ribbons on Jordan’s tree, in front of his elementary, junior high and high school another friend found us on our path. Jordan Moore-Fields would’ve been among the graduates walking across the stage this June at Amherst College in Massachusetts. This weekend, his family will honor his memory with a special tribute that many in Oak Park will get a chance to see. 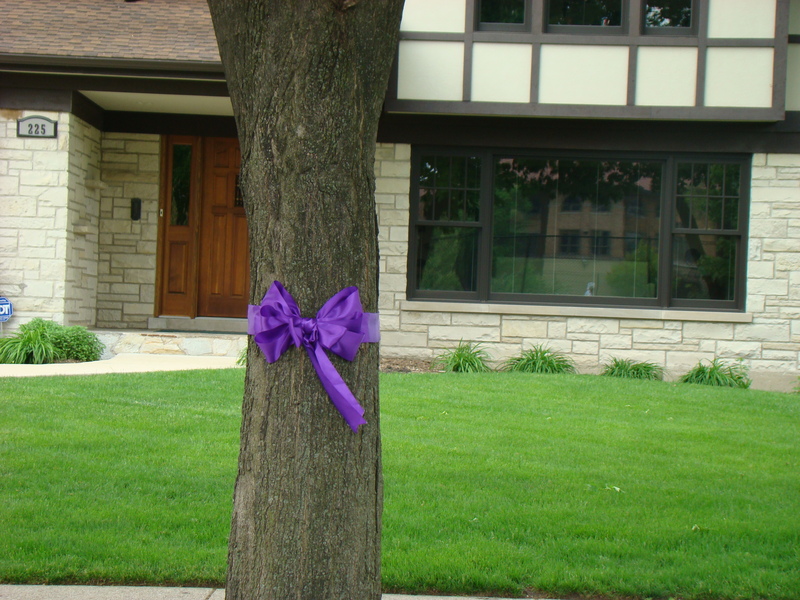 On Saturday, May 21 and Sunday, May 22, his family will place purple ribbons around town to mark what would have been his graduation from college. 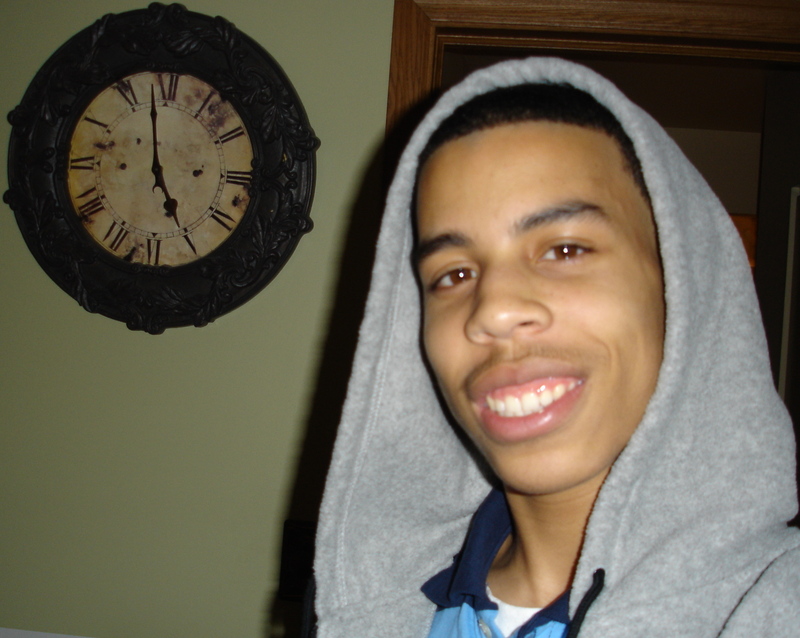 Moore-Fields, an Oak Park and River Forest High School alum, died in a car accident in fall 2008 while on his way back to Amherst. The three other passengers in the car, his college friends, survived with minor injuries. Moore-Fields, 19, was a passenger during the ride. “As I proudly watch his friends take the next step in their journeys, my family needed to show our forever pride in Jordan,” his mother, Jackie Moore, said in an email to Wednesday Journal on Monday. Moore-Fields, one of four children, was a sophomore at Amherst, studying political science. 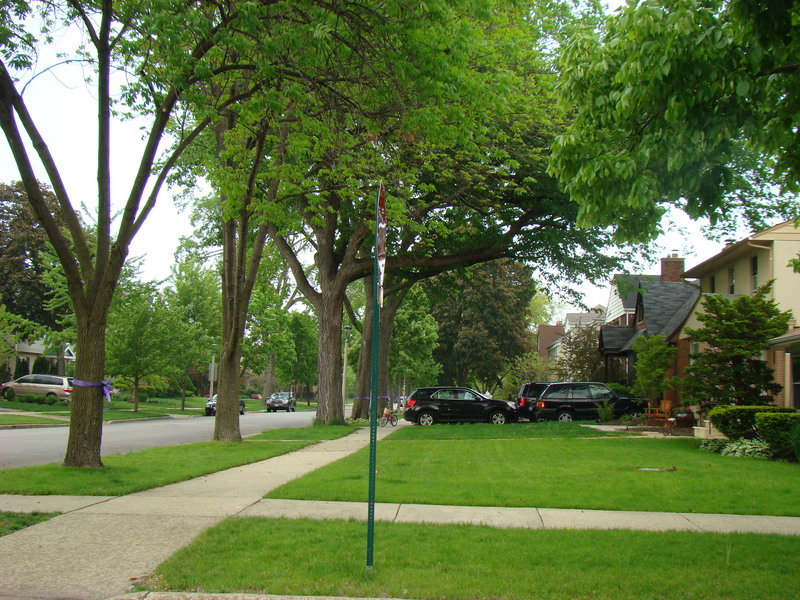 In 2007, Wednesday Journal named him one of its Student Citizen Award winners, an annual honor that recognized high school students in Oak Park and River Forest. He graduated from OPRF that year with 3.5 GPA, worked on the school’s student newspaper, the Trapeze, and also was a mentor to other students while serving on the Minority Achievement Committee (MAC), a group for black male students. I am remembering Jordan this weekend. He would have graduated from Amherst College today had he not tragically been killed in a car crash his sophomore year. He would have graduated top in his class, no doubt, same as he did when he graduated from OPRF in 2007. Jordan was a shining star in all that he did. His death did not mythologize his achievements and character, as can sometimes happen. He earned his kudos while he was still with us. 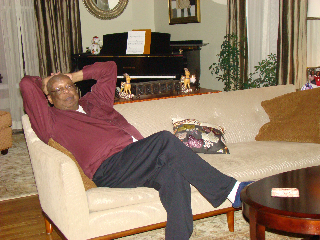 Jordan was my next-door neighbor for much of his life. Often he would help be out by baby sitting in a pinch. He was raised to be involved in his community. To pitch in. To make a difference. Sometimes I couldn’t even get him to take money for his service. He did, however, appreciate payment in homemade cookies. I am thinking too of his family. 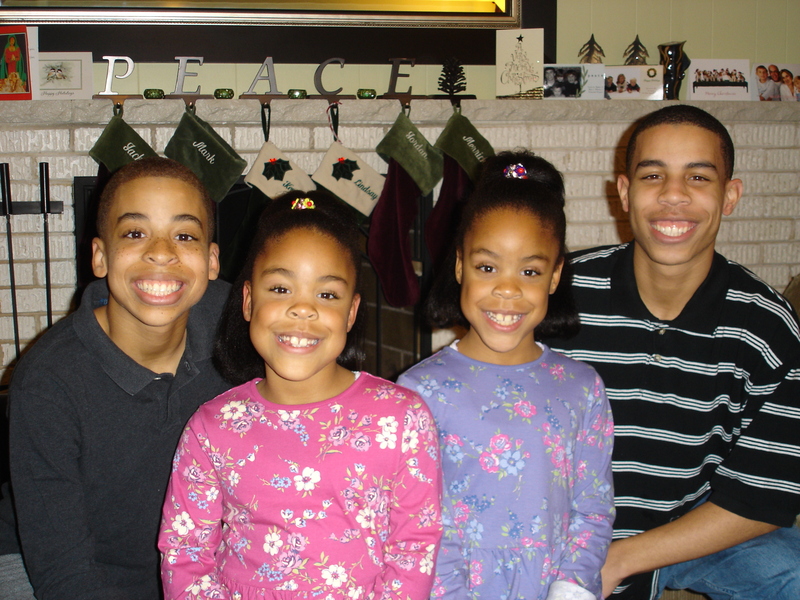 A family that produced four children of extraordinary integrity. A family with the heavy burden of burying a son and brother. A family simultaneously celebrating the graduation of another son and mourning the loss of what Jordan might have become. I follow their journey via Jordan’s mom, Jackie’s blog (alwaysmomof4.wordpress.com). Maybe you do too? Jordan was on my mind all day yesterday. When my roommates saw me struggling to tie the ribbon around the front tree by myself, they came out to help. I explained what I was doing and why, then Nick, Shanza and Eric helped me tie the ribbon and take a photo. My friends never met Jordan, but I talk about him enough that they know in what high esteem I hold him and how important he is to me. We stood in silence for a minute after Nick took the picture, and yesterday at around 7:00 last night four kids in Urbana, IL were thinking of both Jordan and your family. Thank you so much for organizing the ribbon program, this was a great way to honor and remember Jordan. It poured most of today; I thought it appropriate. 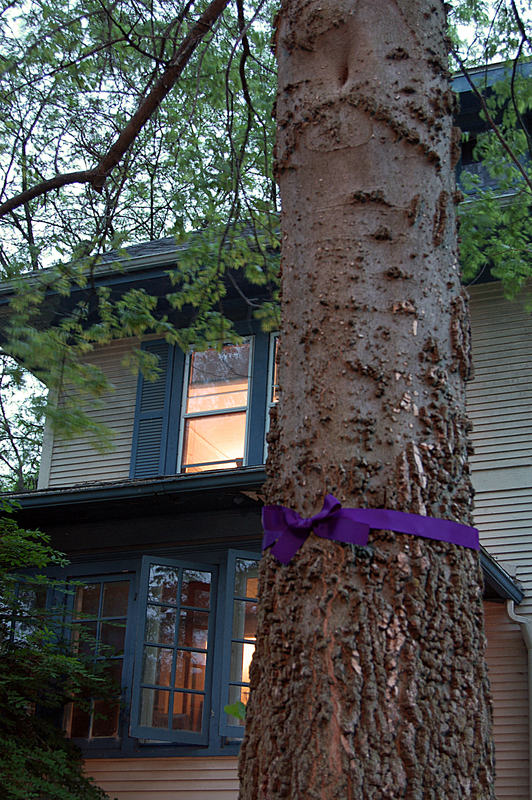 Early this evening, the sun came out and I was able to take a purple ribbon to my front yard. My plans for a big, elaborate display in the maple tree were thwarted by the weather and the soaking grass beneath my feet. 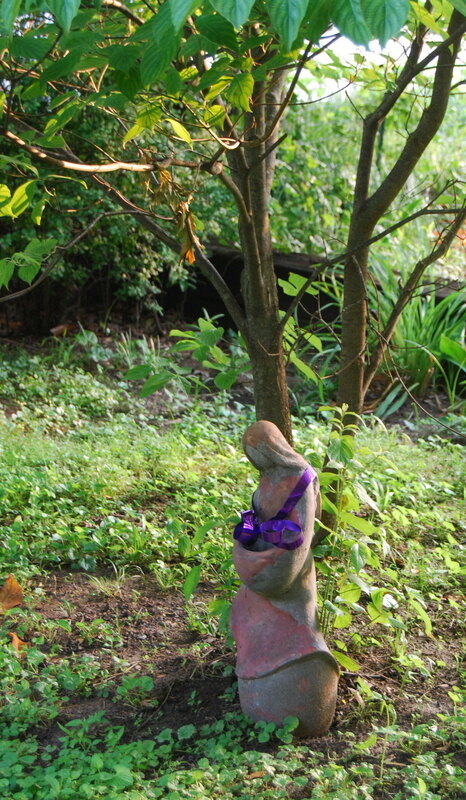 Instead, I took a smaller, shiny purple ribbon and placed it over the shoulders of the statue of the woman that feeds my birds, under the dogwood tree. I called Jordan’s name into the sky and wished for peace for you, Mark, and your three earthbound children. Then I recited this poem, by Robert Desnos, translated from the French by X.J. Kennedy. That now I’ve no more left of you. To be a shade cast time and time again into your sun-transfigured life. I’m sorry, Jackie, so very sorry. I hope the attached photo is a help. Please feel free to use any of this on your blog, if you wish. Please know that we remember Jordan today and every day! 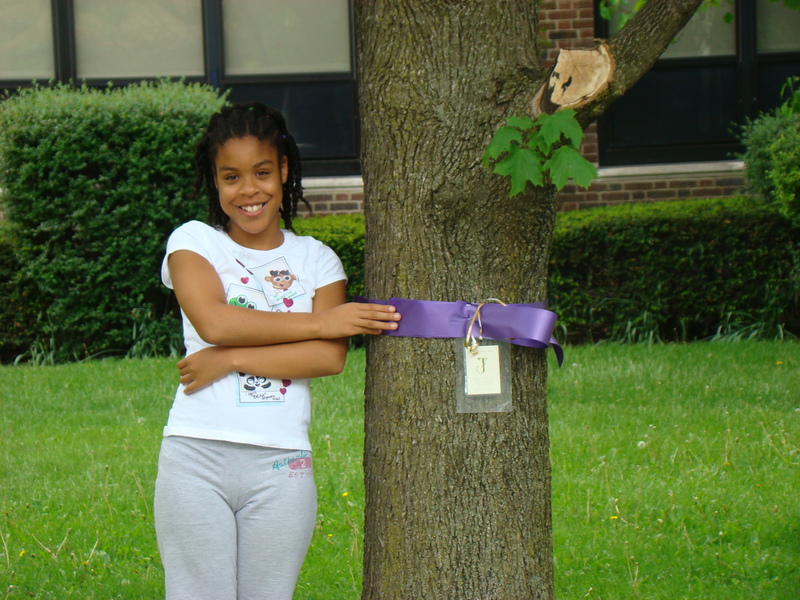 Attached is a picture of Christian placing an Amherst purple ribbon on our tree today to honor Jordan. 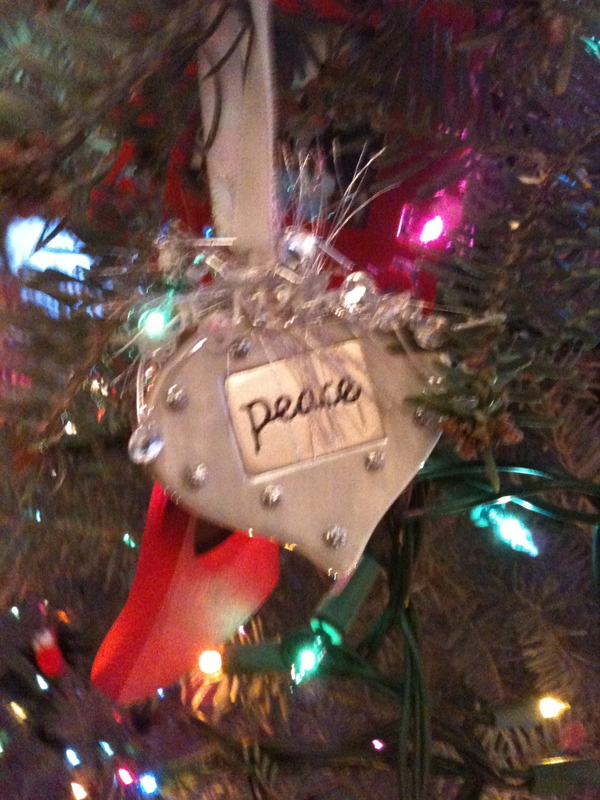 We are thinking about you and your family and we wish you peace! 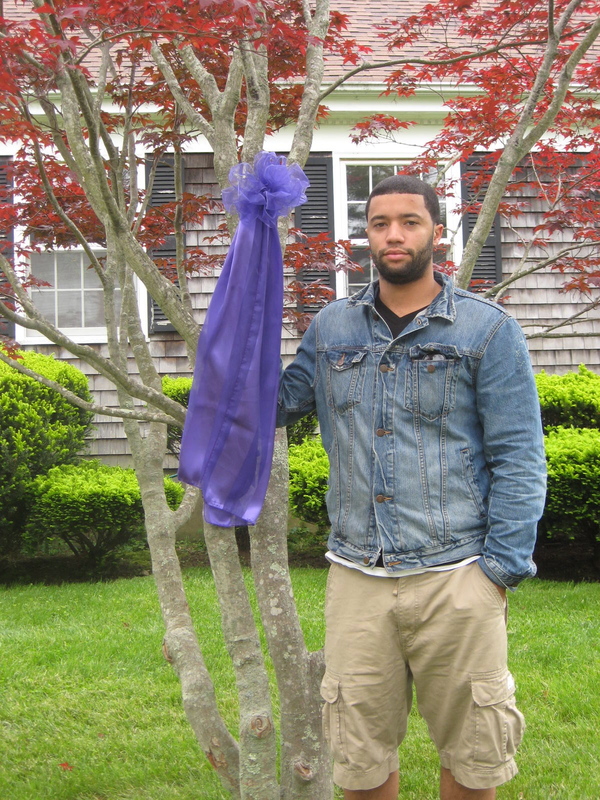 Christian standing next to purple ribboned tree in his yard. There were also so many words of encouragement and grace given to me by my Facebook friends and family. Many of them changed their profile picture to the Jordan Button for the day. Our family and friends near and wide helped us to get through a tough day. I was glad the sun was shining and that there were many people out and about stopping to look at the ribbons and read about my boy. Thank you all for being so understanding of my need to pay tribute to Jordan in this way. I am blessed to be thought of and cared about by such wonderful people. If there are more pictures out there please feel free to email them to me or add them in the comments section and I’ll include them in my Purple Ribbon Album. Kendall standing next to a tree outside of the elementary school that all my kids attended. 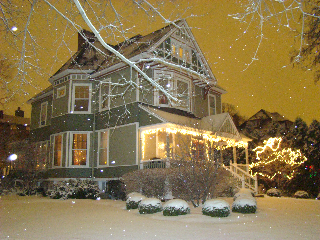 The most fancy and first ribbon that adorned our neighborhood. Thank you Cynthia and family. A view down our old block ribbons were placed on every other tree. Mark made sure to put a placard on the tree in front of our old house. For me, the universe did shrink when Jordan died. I felt it every time I had to remind myself to breathe when I didn’t realize I was holding my breath. I felt it every time I looked outside and wondered how people still knew how to walk and converse and laugh. I felt it every morning when I opened my eyes, looked around my bedroom and then closed my eyes again, because having a dead son makes it hard to imagine how you’ll fill your day. 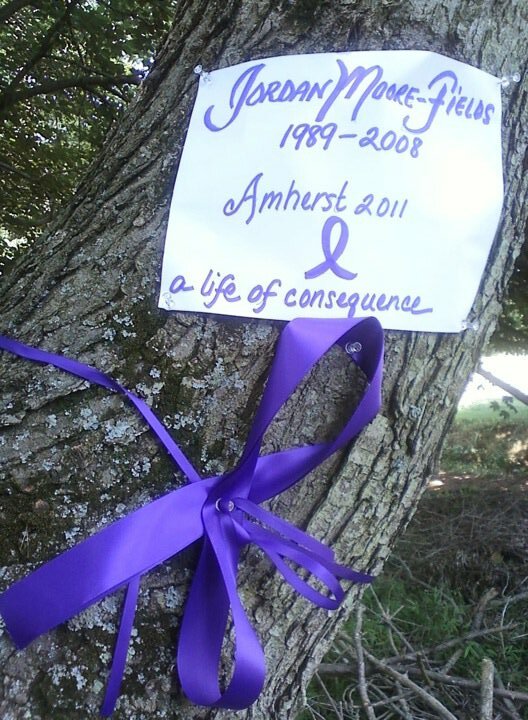 In my last post I talked about consciously mourning the fact that my family doesn’t get to see Jordan graduate from college and that to honor the Amherst commencement we will tie purple ribbons around the trees in our yard and on Jordan’s tree and I asked others to do the same. Since that post, a very kind and generous woman named Dafeenah who found my blog through She Writes has given me a way that others can honor Jordan and help him to be remembered. 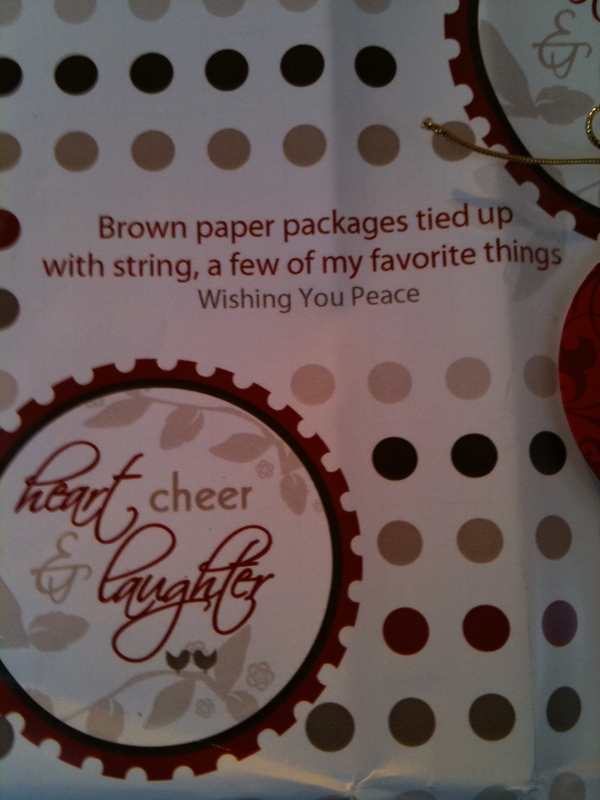 She wrote saying she didn’t have a tree to which she could tie a ribbon, but she could make a button that she could place on her blog. She asked my permission to design the button. I cry every time I come to the part of her asking permission. It reminds me of Jordan’s friend Sean asking permission to wear Jordan’s birthday as his football jersey number. The respect and grace people have shown me in the face of my sorrow as they help me honor my son is so humbling and helps tilt the earth just a little bit back to the axis of beauty that I knew before Jordan died. I am forever grateful. 2 ½ years have passed since Jordan’s death. It is a short amount of time and a lifetime all at once. The passage of time and the constancy of love are teaching me important lessons about keeping my heart open to the present and the future. 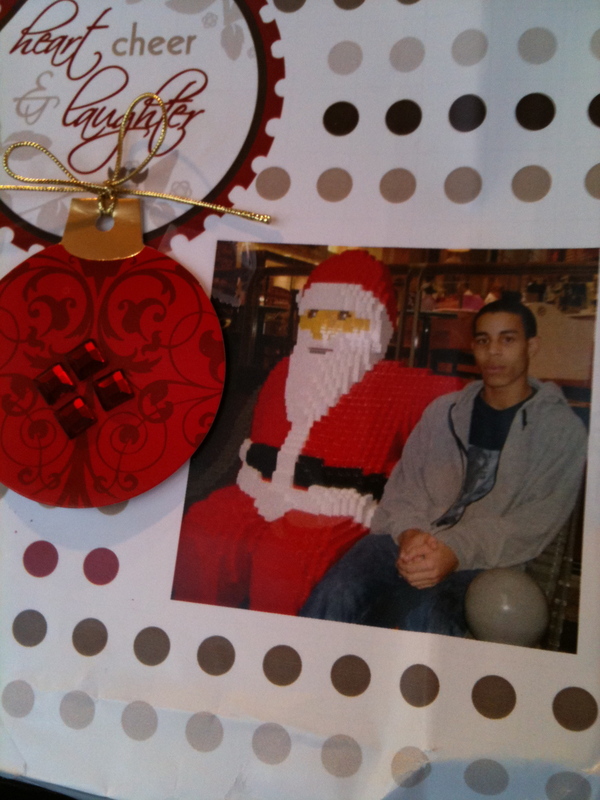 The fear I had that my son would be forgotten is unfounded. Family, friends, and strangers who quickly become friends because of their compassion, are showing me that a shrinking universe can expand again and that I can be a part of it. 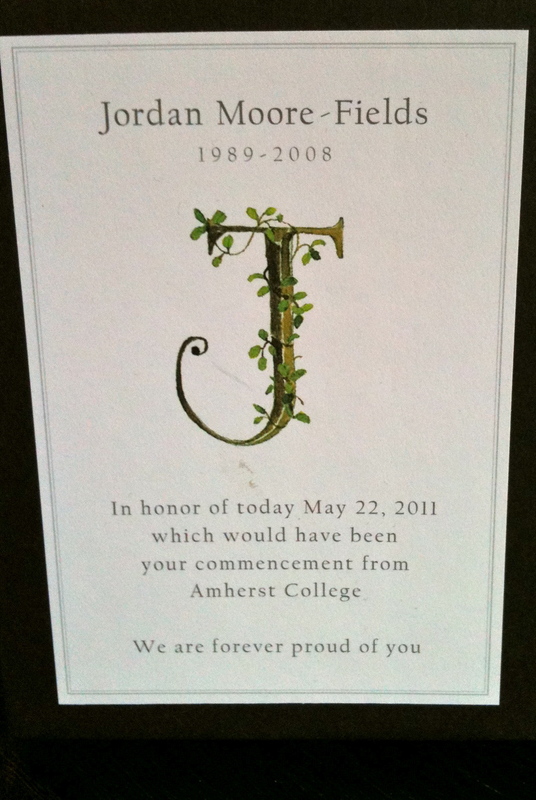 The button is displayed below and will be on my blog through May 22nd the date of Amherst College’s commencement. Any of you that would like to display it on your blogs; Facebook pages or wherever you feel is appropriate I would be honored. 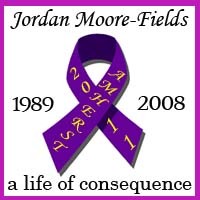 The button says a “life of consequence” which aptly describes Jordan’s life, and are also the commemorative words associated with the Jordan Moore-Fields’ Amherst Scholarship fund. One daughter handed me a tissue, as the other rubbed my back. We’ve yet to get our Christmas tree. Before Jordan died we went as a family to pick out a tree. Everyone weighed in before we would make our final decision on our perfect tree. Jordan always liked the fuller trees with the feathery leaves. 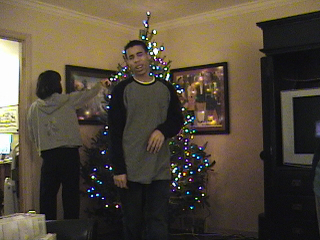 Mark wanted the tallest tree our house could hold. Merrick, the girls and I liked the trees with the firmer branches that were taller and not as wide. Every year after we’d picked a tree I would race back to the car, fleeing the cold. I’d sit and watch Mark with the kids trailing behind him or swirling around him. The family ritual of all of us piling into the car and heading to the same lot every year to choose a tree has changed. Since Jordan died, just Mark and I go to pick out a tree. Our first Christmas, Mark and I went to a tree lot we had never been to before and picked up our Christmas tree on the way home from the grocery store. It wasn’t a decision we discussed, but as we turned onto Chicago Avenue I looked at Mark and said, “Let’s just get the tree here.” He made a quick right turn and parked. We hadn’t talked to the kids about changing our ritual but neither one of us could bear to go as a family to pick out a tree without Jordan. After listening to Lindsay’s suggestions for our tree this year, I thought of other “ornaments,” that can adorn our tree. Jordan’s key ring, which still holds his house keys, will be hung from a branch. 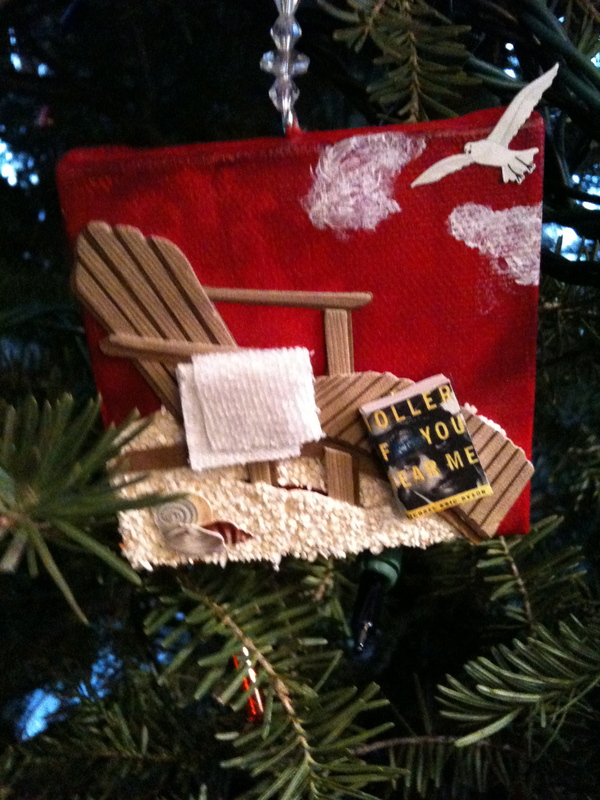 A set of ear buds will be on the tree too representing the way Jordan carried music with him all the time. 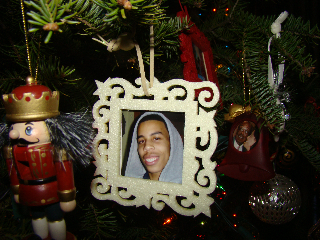 And an ornament will be made out of a picture of Jordan wearing one of his favorite hoodies, the way we remember him best. All of these ornaments will be in a box near the tree. Each of us in our own time and communion with Jordan will add them to the tree keeping him close and a part of our Christmas.